A whole lot of adult beverages going down in Phoenixville. If you haven't been to Root Down, you should probably rectify that soon. Oh, and by the way, not many local breweries are doing Altbiers, let alone very good Altbiers. 3-Legged Rabbit Altbier is just such a brew and unfortunately available only very occasionally, but for this one guy at least, I believe it should be more often. 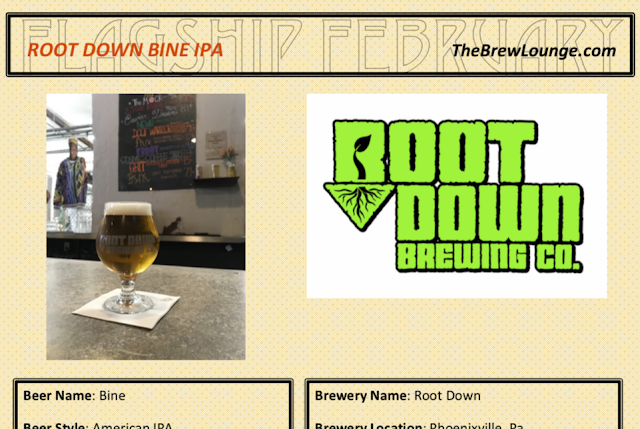 Now go click the picture below for a full feature on Root Down's Bine IPA. Disclosure: For this project, I solely created the list of 28 beers featured here on The Brew Lounge. I was in contact with each brewery and neither required nor requested complimentary samples. Today's Root Down beer was provided to me by the brewery while I was at the bar discussing the brewery and the beer with owner Mike Hamara.